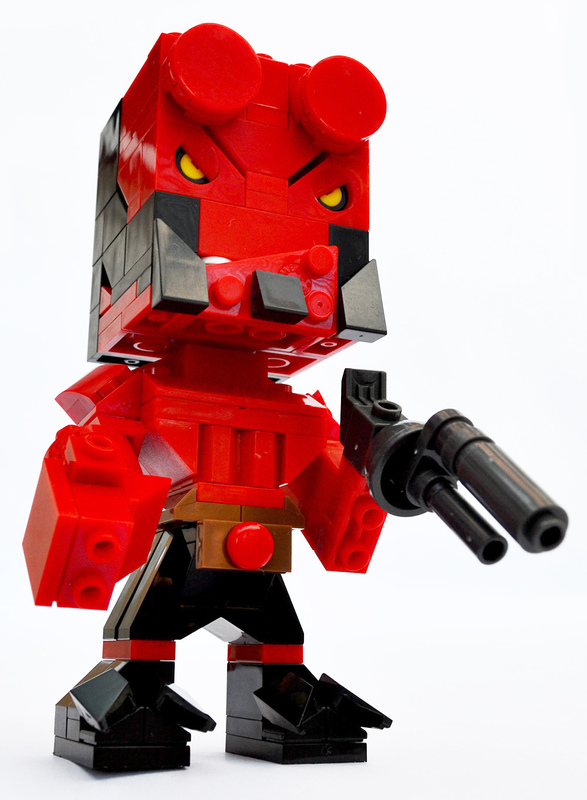 Hellboy Kit by Mega Bloks | 'TAIN'T THE MEAT… IT'S THE HUMANITY! Mignola’s Hellboy first saw print in 1993 and the comic’s unique blend of action, horror and humour — mixed with Mignola’s love of European folk law — quickly became a hit with readers, myself included. 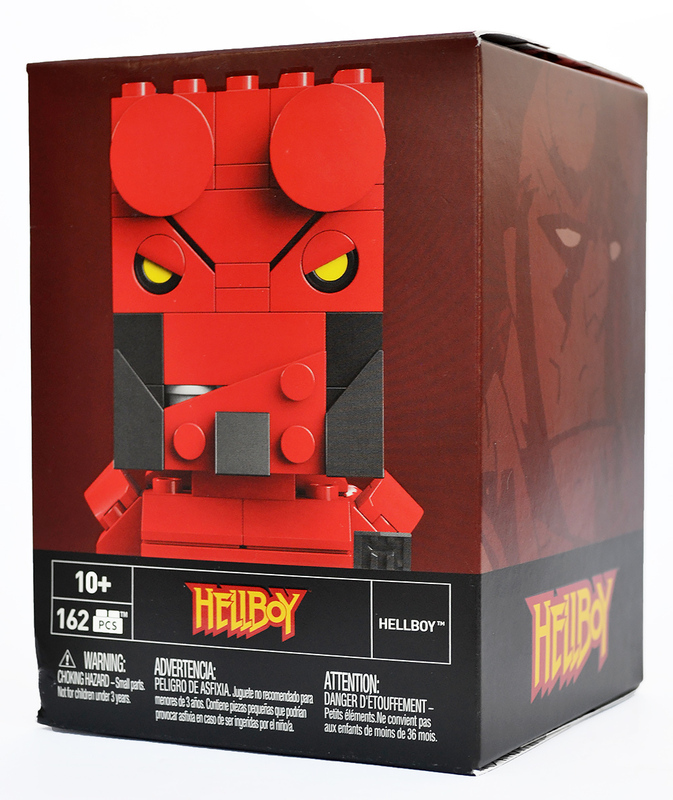 Over the years I’ve picked up several action figures and collectibles based on the character, but this is the first time I’ve seen Hellboy rendered in construction blocks. The set was released by Mega Bloks, under their Kubros imprint. 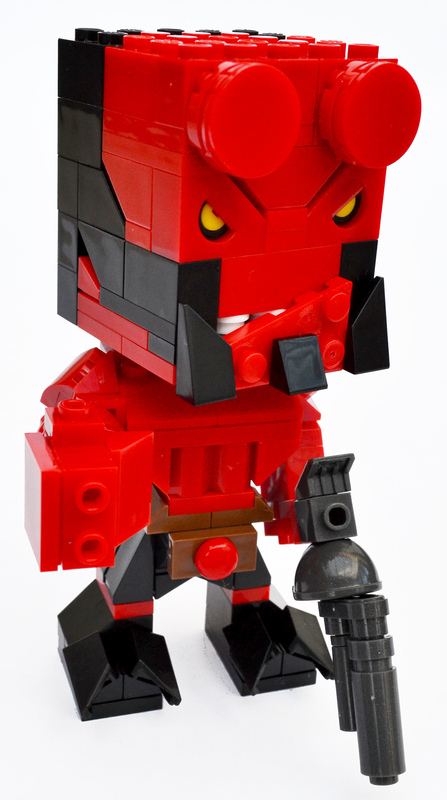 The bricks are essentially a rip-off of Lego, and although Lego have licensed dozens of big name characters, to my knowledge they don’t have one for Hellboy. So what’s this Hellboy figure like? First off let’s take a closer look at the packaging. The full colour box measures 6 x 4 inches and is adorned with photos of the finished item as well as one of Mignola’s Hellboy illustrations on the side. The back shows six other figures in this collection, which include Worf from Star Trek: The Next Generation, Kevin from Despicable Me, and the T-800 from The Terminator. The packaging is cleanly designed and very attractive; both the photography and Hellboy logos also sport spot varnish, which is a nice touch. The top of the box features a pattern mimicking the studs that appear on top of the bricks; these have been embossed, also a nice touch. Lastly, for those who don’t want to damage the box when opening it the bottom flaps have not been glued, rather they are held closed with a transparent piece of round tape (which can be easily sliced open). For a toy as inexpensive as this the packaging is of a surprisingly high quality (more on the price later). 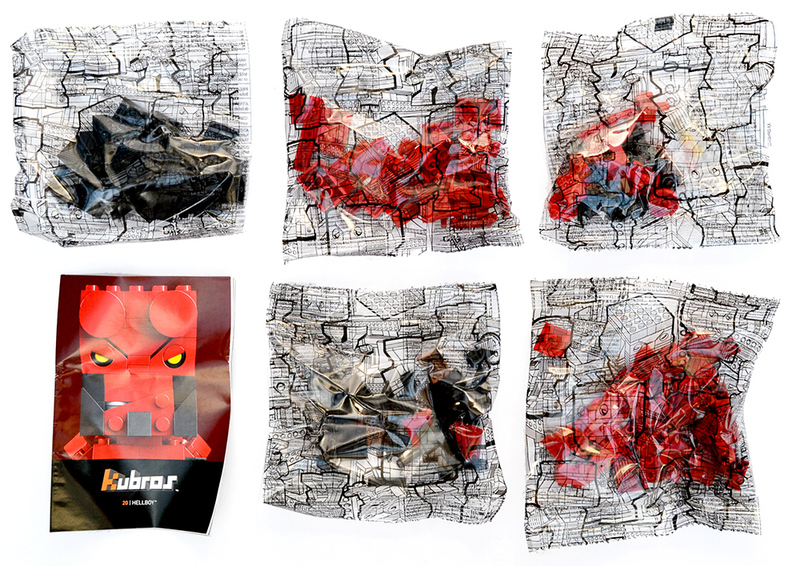 Inside the box are five transparent bags that contain the 162 pieces needed to build Hellboy. Also included is a small 36-page, full colour instruction book. The bags are decorated with simple black line illustrations that are also reprinted inside the box. 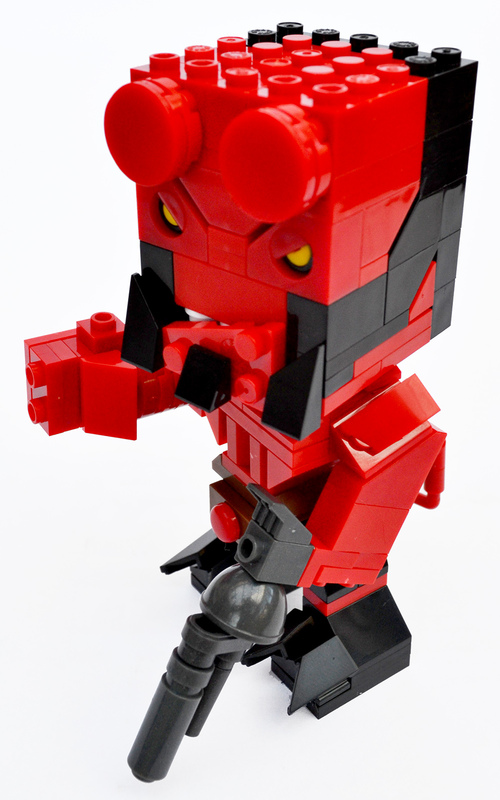 Hellboy features three points of articulation. When constructing this Hellboy toy you’ll quickly realise that the items in the bags are in no particular order, so you’ll just have to open all of the bags at once (if you’re like me you’ll probably just end tipping everything out on the table before you get cracking). Similar to a Lego kit the instruction manual consists of pictograms and the instructions are simple and clear. 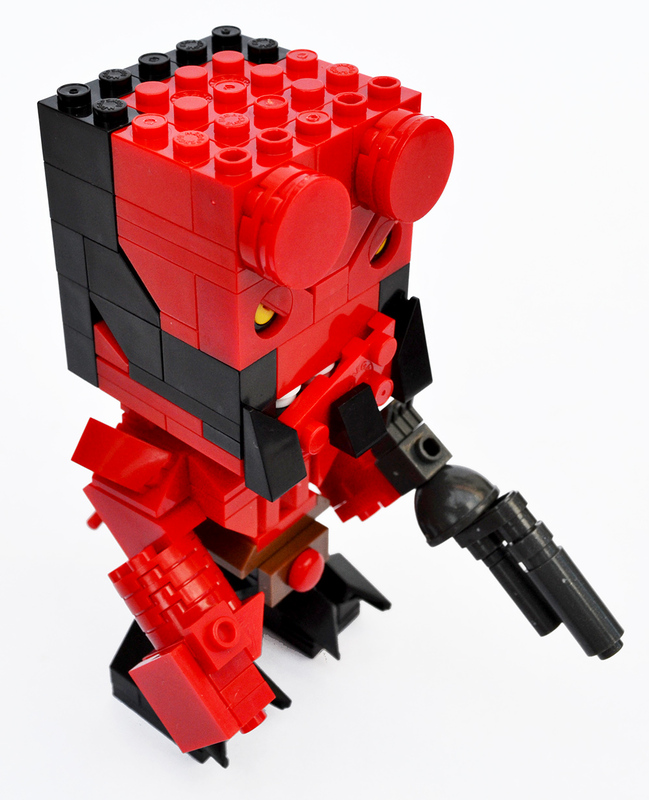 From start to finish Hellboy took me just under an hour to put together, although I’ll confess I wasn’t exactly trying to beat the clock. When I was done I discovered that one small piece was missing, but as this brick goes under Hellboy’s left hand it’s absence isn’t really noticeable. I’d also been supplied with four random extra pieces (something else Mega Bloks has in common with Lego). The finished model features three points of articulation: his head swivels at the neck, and both his arms move at the shoulders. His tail can also be positioned differently. Hellboy‘s eye lids can also be rotated: he can look either happy, sleepy or angry depending on your preference. I think angry suits the character more. Once built it becomes apparent that this is a pretty decent little toy. The finished model measures five inches in height and it’s of sturdy, solid construction. I like the little glimpse of teeth behind his jaw, as well as his six pack. His Right Hand of Doom is effective, as is the build of his gun. I also like the gold Kubros ‘K’ logo that sits in his right heel. 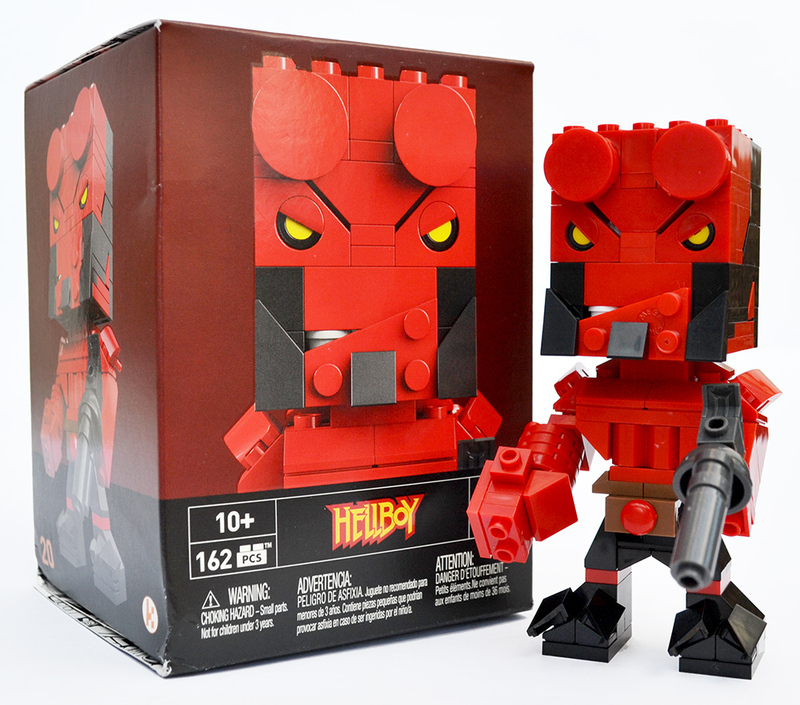 This Mega Bloks/Kubros Hellboy toy set me back £8 on ebay, which is about what I reckon it’s worth. I’ve seen the kit changing hands on Amazon for double that price but frankly, as nice as it is, it isn’t worth £15. Along with Hellboy Mega Bloks have also released an Abe Sapien figure, and I’ll be taking a closer look at that in the next week or so (click here). 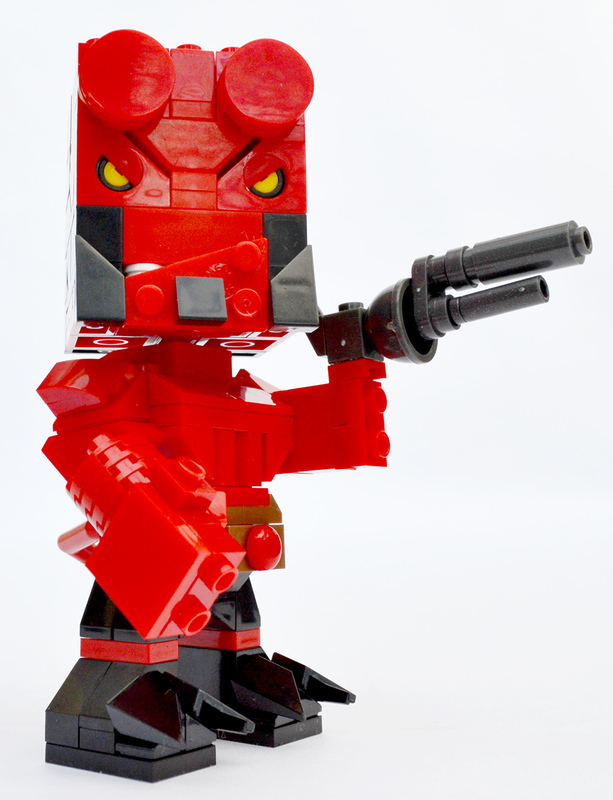 In the meantime I’m very happy with my little Hellboy figure — it was a fun build and it looks good on my desk. It may not be the most realistic depiction of the character I’ve seen, but as a Lego (sorry, Mega Blok) toy it has a great deal of charm. BOOM!